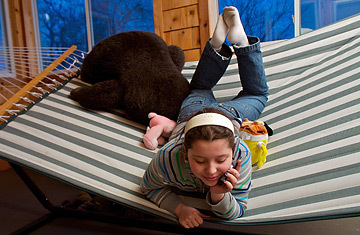 Rachel Cole, 10, talks on a Kajeet cell phone, Oak Park, Illinois. Rachel's first breathless call was to her grandparents. "Guess what, I have my own cell phone," exclaimed the cutting-edge fourth-grader through her shiny, tricked-out handset. The perplexed, interstate scowls at other end of the line were easy to envision. "Why do you need that?" retorted her disapproving elders virtually in unison. My nine-year-old didn't have an immediate answer, but instinctively and ineffably, she knew she had arrived. Kajeet, the Bethesda, Maryland start-up that provided Rachel with the Nokia 6165i as one of 3,000 volunteer "beta testers" for a new service aimed at kids, developed in large part from input by kids. But it will have to sell the idea that children can handle it to the potential buyers, their parents. "We think kids are smart," said Kajeet's cofounder and CEO Daniel Neal. "Our entire philosophy springs from this one core idea. We want our kids to be agile with technology and we want to help them respond with confidence to what's happening in their world." While the major carriers raked in $100 billion last year, wireless services aimed at tweens is minuscule. But precisely because most adults now have cell phones, as well as some 90% of teens, persuading the remaining Luddites to retire their rotary dials and go wireless is hardly a growth proposition. The tween market  roughly kids ages 8 to 12  has a wireless market penetration of only about 25%, and most of that clustered at the upper end of the range. Kajeet and others see a market in driving wireless tech to the SpongeBob set. "The major carriers design their service for Wall Street, not Main Street, and certainly not for its relevance to family life," says Neal. Telco giants have other motivations for not aggressively courting kid customers. "They want to avoid looking like Joe Camel and preying on children," said Roger Entner, a Boston-based wireless analyst with the Ovum research firm. "So they haven't done much more in this area other than create family plans." That intentional oversight has left a wide-open playing field for the likes of Kajeet. Hatched in 2003, Kajeet's executive team has spent the past few years doing homework, conducting research to figure out what kids want, and how to offer it safely and affordably. Early on, Neal and his two partners, all dads with young kids and extensive hi-tech resumes, decided there'd be no contracts or cancellation fees, to reflect the flexible, whimsical nature of kids themselves. Phone prices will range between $50 and $100, but how much families spend a month for service carried on the Sprint NEXTEL network is entirely a personal choice. The company expects to sign 175,000 customers in the first year. Kajeet, which is selling on the web and hits retail stores such as Best Buy in March, is a pay-as-you go service that offers a menu of customization options for kids and parents. Through its "walleting" system, a parent deposits money into an account that allows kids to buy whatever they want from Kajeet  no less than nine SpongeBob ringtones to choose from ($2 each), celebrity wallpaper offerings, an ever-changing list of games, texting services and, yes, phone calls. If a kid's Kajeet allowance is $20 a month and he blows it all on an Ice Age 2 game, Beyonce wallpaper and a few ringtones, he won't be able to text or phone anyone  except his parents and 911, which are never blocked. "It helps kids learn about budgeting and responsibility without locking families into long-term commitments," said Neal. The proposal also intrigued some adult investors who have put up $27 million in venture financing. Kajeet isn't first to market. Firefly Mobile over the past two years has signed up about 200,000 customers under age 12, touting its parental controls and simple design: the five-button handset lacks even a number pad. Though garnering low marks for style, the clunky Firefly has surely helped some divorced or single working parents who spend a disproportionate amount of time apart from their children. Disney similarly rejected coolness as a priority when it launched its mobile service last spring. "They don't even know who their customer is  the parent or the child," said Entner, noting that he expects few parents to ditch their current mobile device in favor of a Disney-branded handset, a requirement for using the service's child-tracking features. Kajeet is trying to blend cool technology with practical parenting to create a must-have gadget. At a suburban Baltimore research facility recently, a group of pre-adolescent beta testers prepared to share their feelings about the service. The good news for Kajeet: all four guinea pigs, Christian, Derrick, Trent and Nick gave the phone service high marks. "I've been wanting for something like this for a year. It makes me feel independent and my friends can find me anytime," said Derrick, 12, adding after a pause, "and if I'm in trouble I can call my parents." Kajeet will offer versions with and without cameras, but the group was unanimous that a phone that couldn't take pictures was hardly worth having. It is surely not the most difficult job in sales to persuade a kid of the appeal of a cell phone, especially one with serious mega-pixels, built-in video recorder and a web browser with access to a "walled garden" of family-friendly games from the likes of Nickelodeon. (Platinum Sudoku: $5) My daughter's one frustration was that the embedded foreign language translator could come up with no Spanish equivalent of "cranberry," which would have been helpful for a school assignment. Getting a critical mass of parents and their wallets on board will be another matter. Under the current pricing plan, calls are 10 cents a minute, while texting is a bargain at 5 cents. Kajeet recognizes that it'll be kids themselves, rather than adult-focused advertising, who will be the most effective arm-twisters. "I wouldn't be bugging my parents so much when I'm bored," said Derrick. "My parents would be happy that I don't have to borrow their phones anymore," said Nick, 11, gleeful as he casually set the phone's calendar alert to remind him of his birthday until he turns 89. Not surprisingly, few of the 10 kids who offered up thoughtful opinions over two sessions were jazzed about the features that allow parents, using a website, to set the hours that calls can be made or specify which individuals can call their kids. But only one lad expressed doubts about the location tracking software under development. "There are times I just don't want to be found," admitted Trent, 12. Ironically, Kajeet's success may well have little to do with actual phone calls. The device is really a next-generation multi-media networking platform in a youthful and slightly edgy package. Or in other words, an alluring toy. A few weeks into my daughter's testing phase, I spotted her roaming around the house delightedly barking into the handset: "Code Red Alert. Code Red Alert." Under closer scrutiny, it became clear the phone wasn't even switched on. When I asked what she was doing she breezily replied: "I'm just playing. None of my friends have cell phones so I don't actually have anyone to call," she said. If Kajeet's homework pays off, that won't be the case for much longer.